Early one morning I finally had an opportunity for some uninterrupted quiet time (or so I thought) to try some trance drumming with my new drum. I settled back on my bed in a comfortable position and began drumming a steady beat, trying to quieten my conscious thoughts and let myself drift into a dreamlike meditation or trance. After a while the sound of my drumming somehow changed the quality of the sounds from outside my house — the birds, aeroplanes, distant traffic noises — and they all blended together to become the rushing sound of the wind carried along by the steady drum beat. An image of thick rounded cumulus clouds formed in front of me. They had shadows of yellow and violet within them, outlining their billowy folds and starkly highlighting their otherwise clean, white fluffiness. I flew through the clouds, higher and higher through their cool damp mist until I was above them in the clear blue sky. 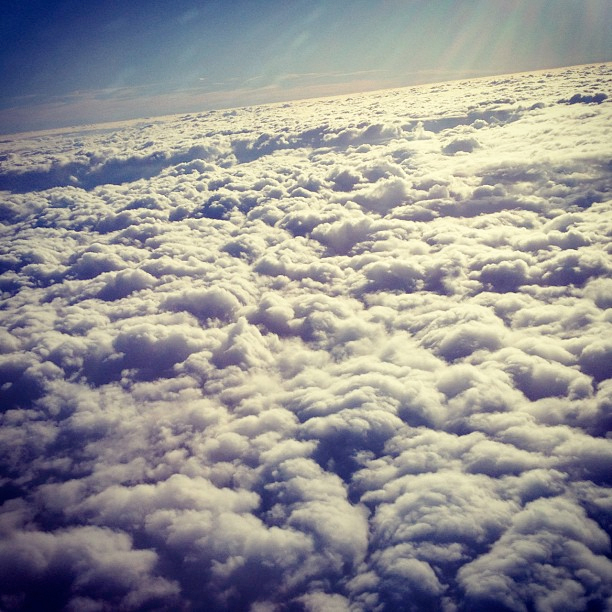 Looking down, the clouds looked softly solid, as if I could curl up comfortably on them and go to sleep. I flew on for a while, marveling at the sensation of flight and absolute freedom of gliding on the breeze, before descending through the clouds to see the earth below. As I flew closer I realised I was flying over a large pine forest that stretched for hundreds of kilometres over undulating hills and partway up along the sides of the snow capped mountains ahead. 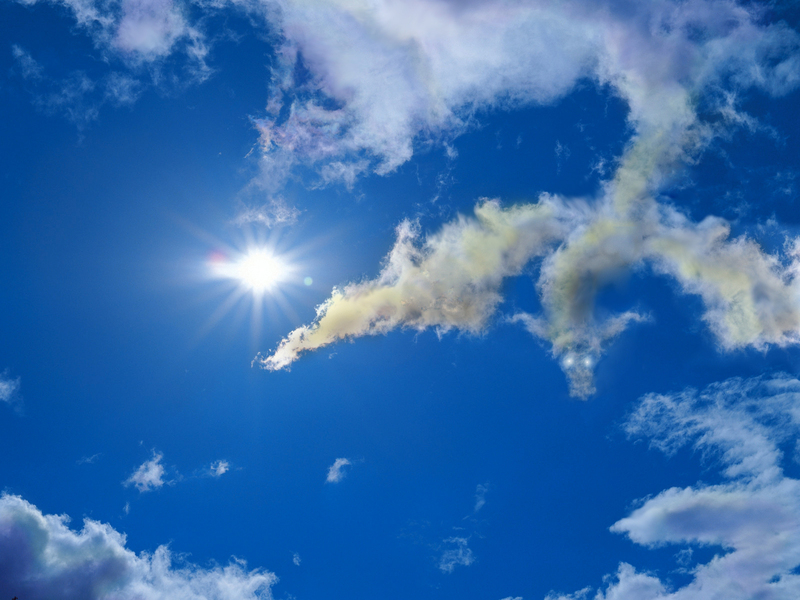 The green of the trees was in stark contrast to the blue sky and the white, yellow and violet colours of the clouds. My attention was diverted upwards again, as I saw the shape of a dragon begin to form in the clouds. It gradually took on a slightly darker, brownish tone which set it apart from the rest of the clouds. 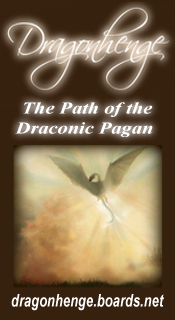 Large wings spread out either side of the dragon’s long, curved neck, then it slowly faded away as the clouds it was made of were dispersed by a gentle breeze. Flashes of bright yellow suddenly flooded my mind. A woman’s face then flashed into view. She had pale skin and long, wavy red hair hanging down past her shoulders and I could see just the top of her sky blue gown. Below her shoulders the rest of her body faded into white mist over the bright yellow background. There were beautiful dark pink flowers in her hair, on her left, and she had piercing blue eyes that looked straight at me, and through me, before she too faded into cloudy oblivion. The image of a grey rabbit now floated in front of me. The rabbit blinked at me then casually hopped a short distance away and started nibbling at the grasses and other small plants and flowers growing at the edge of the pine forest which was now also revealed. Then the rabbit disappeared into the cool shadows of the forest and that scene also faded. I was back in amongst the fluffy clouds, flying over a distant landscape with the sound of the wind rushing in my ears. A white silhouette of a rabbit flashed past to my left, then the head of the dragon reappeared in the distance in front of me. I followed the dragon but the closer I got, the more it started to dissipate back into indistinct cloudiness. A word started to form in my mind. Before now I had never consciously heard this word, which I felt was probably a name, and I saw it spelled in two different ways — Galaya or Gallaea — before it too faded from my sight and hearing, only to be replaced by white mist and the rushing sound of the wind, and the sounds of a waterfall in the distance. I had no idea who or what it was. I continued drumming as the wind grew louder and louder (and the waterfall receded further into the distance), but I soon realised something was starting to feel very wrong. I was disappointed to find that I was being pulled out of the meditation. The sound of the roaring wind was now right outside my window rather than in the dreaming place and it was quickly transforming into the noise of a very loud, early morning street-cleaning truck on the road directly outside my house. Damn it!! I would have liked to have stayed longer but I guess trucks and traffic noise are just part of the environment for an “urban shaman”. In spite of the noisy intrusion it was an interesting and successful first journey with my Dragon Drum. 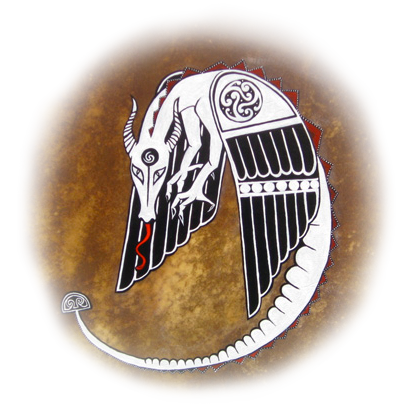 The Air Dragon brings represents inspiration, vitality, intellect, respect, insight and illumination. This power animal must be handled with the greatest of respect. With this power animal, large flashes of illumination in intellect and psyche are possible. Insight and clarity will be given for all problems. As always – trust your inner voice. The Water Dragon brings connection, depth and passion. The water dragon as power animal brings memories and wishes, perhaps long forgotten yet hidden, to the fore. By squaring up with painful past experiences, a sense of peace and balance can be achieved in our lives. The water dragon will give you the courage and compassion in this challenge. Receiving hidden teachings and intuitive messages. Active around dawn and dusk, (the time of the fairies and fauns), they are guides into the mystical shadow world and it is said that if you follow after it the rabbit will lead you to the fairy realm. Rabbit is known for its ability to procreate and fearful thoughts will procreate (manifest) into what you fear. Movement by leaps, living by ones own wits, not getting boxed into a corner. Take advantage of opportunities that may present themselves only for a brief moment. Examine the foods you eat and perhaps eat more of a vegetarian diet. The Rabbit is a spirit animal that is extremely open to one on one communication and when approached as an equal it will show great wisdom and guidance. The name of Galaya creates an easy-going, good-natured personality, meeting and mixing easily. Although you have many creative, original ideas, procrastination is your worst enemy because you can seldom make decisions and carry them out. The name Galaya creates the urge to be self-expressive and happy, but we point out that it causes procrastination and lack of confidence, and thus you are unable to realize your goals and ambitions. This name, when combined with the last name, can frustrate happiness, contentment, and success, as well as cause health weaknesses in the liver, bloodstream, and fluid systems. Hmmm… very interesting! …but not totally ‘me’, except for the procrastination part, lol. I’m not sure of the significance of this name turning up in my meditation …some shadow attributes to contemplate perhaps? Or maybe it’s the name of my drum? Or maybe the Water Dragon that didn’t turn up but maybe tried to? Your name of Gallaya has made you versatile and creative. There is hardly anything you cannot do if you put your mind to it, but a driving urge leads you to one experience after another, seldom finishing what you start. You cannot find peace of mind or lasting contentment in anything you do. As soon as a challenge is met, boredom sets in, and you yearn for another experience. This restlessness makes it difficult for you to assume responsibility and to establish stable, progressive conditions in your life. Though the name Gallaya creates the urge to be self-expressive and ambitious, we point out that it causes a restless intensity that hinders the ability to relax. This name, when combined with the last name, can frustrate happiness, contentment, and success, as well as cause health weaknesses in the liver, bloodstream, and solar plexus. Extended Description of Gallaya: You could do well in sales work or in meeting the public where quickness of mind and expression are all important. You have many friends, but lose interest in people very quickly. Your intense mental activity spoils system and concentration, and plays havoc with relaxation and sleep. Out of your quick thinking has been borne hasty speech. Acting on impulse instead of with forethought has led to many disappointments and bitter experiences. Health Weaknesses of the name ‘Gallaya’: Your whole nervous system could be affected by the intense emotional influence of this name. The priests of Attis and Cybele of Phrygian and Greek mythology, known as Galli or Gallaea, perform a yearly ritual, mostly wearing yellow clothes, to purify the body of the dead Attis. A pine tree is chopped down, covered with violets and carried to the shrine of Cybele on Mt. Dindymus (Dindymon). Afterwards Attis is mourned for three days, Cybele brings him back to life and there is a wild and joyful celebration. The name of Topaz gives you a responsible, reserved, and dignified nature, able to find a certain amount of success in anything you undertake. You have an appreciation for the finer and deeper aspects of life. Your scholarly, studious interests incline you to art, literature, philosophy, music, and drama. You wonder about the deeper aspects of life contained in religious theories and occult beliefs. Although the name Topaz creates an interest in the deeper aspects of life, we emphasize that it causes a superior, interfering expression whose favorite expression is “I know.” This name, when combined with the last name, can frustrate happiness, contentment, and success, as well as cause health weaknesses in the heart, lungs, bronchial area, worry, and mental tension. Extended Description of ‘Topaz’: Others may consider you to be aloof and unemotional since you often find it difficult to express spontaneously. They could interpret your quietness as disinterest and aloofness, for they do not realize the depth of your feelings and thoughts. You require time alone, especially in the outdoors, to cope with the pressures of life. Health Weaknesses of the name ‘Topaz’: This name causes tension to affect your heart and respiratory organs, resulting in colds or bronchial conditions. Your first name of Dragon has given you an eagerness for knowledge and an intense desire to do something worthwhile in life. Being clever, imaginative, and analytical, you do very well in the activities that hold your attention. You long for freedom from restrictions and for outlets for your restless qualities, and cannot tolerate drudgery and monotony. It is not easy for you to take advice, subsequently; you tend to work alone or independently. You suffer inner turmoil and moods at times especially when you feel misunderstood, and being extremely sensitive, you are easily hurt and offended. Your quiet intensity is difficult for others to understand and thus, you are on guard for fear of being ridiculed or criticized. Loving the outdoors, you enjoy outside activities and the beauty of nature in its many facets. Many people do not realize that you have a depth to your nature resulting from having thought a lot about life in many facets. Although the name Dragon creates an interest in the deeper aspects of life, we emphasize that it causes a restless intensity that defies relaxation. This name, when combined with the last name, can frustrate happiness, contentment, and success, as well as cause health weaknesses in the heart, lungs, bronchial area, and solar plexus. Extended meaning of ‘Dragon’: Because you have high ideals and are a principled person, you have been disillusioned and disappointed in people on many occasions and have experienced much aloneness. You are fond of outdoor sports, where you can find an outlet for your nervous energy. Impulsiveness could bring frequent accidents and unfortunate happenings into your life. You do not like to be restricted or to have your freedom curtailed in any way. You find it difficult to control your thoughts and could swing in moods from one extreme to the other. Your speech can become very critical and sarcastic when you are frustrated or crossed. Health Weaknesses of the name ‘Dragon’: This name creates a weakness in the heart, lungs, and bronchial area, and could cause heart trouble, pneumonia, asthma, or tuberculosis. It also creates tension in the nervous system, particularly the solar plexus and stomach, causing nervous indigestion and relative conditions. The only problem was that I couldn’t look up Dragon as a last name, but I guess in the way that I use it here I don’t actually consider it to be a last name anyway. 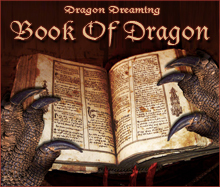 This entry was posted in Dragon Images, Magickal Tools, Magickal, Mystical Moments & Draconic Synchronicities and tagged air dragon, Attis, cloud dragon, cumulus clouds, Cybele, dragon drum, dragon totem, Eostre, Galaya, Gallaea, Ostara, rabbit totem. 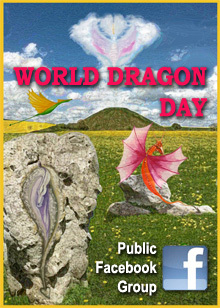 We are Dragon fans and find your site to be one of the best. 🙂 I notice that you have published rituals involving Dragons. 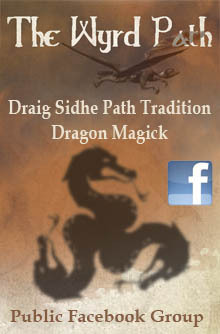 I have written a Dragon ritual and performed it on Mt Shasta in 2007. I would send a copy of it to you should you be interested. Thank you so much for your kind words about my site. 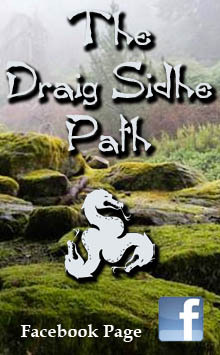 Yes, I would love to see your dragon ritual and publish it here on my site (with full credit to you as author, of course, and with a link back to your website or blog). Please send it to draconictopaz@gmail.com 🙂 I look forward to reading it! I have to apologize for not replying. I read your reply then got very busy (had the flu etc) and I (sniff) forgot about. Anyway, I have a copy of the ritual with pictures that I took at the time so I am in the process of asking my friend if it is okay to post those pictures (assuming you don’t mind embedded pictures in a MS Word document. I should hear from him soon. I have received permission form my friend Ed Sitch (AKA Ed Fitch), to use his unaltered pictures in the ritual and name. You can therefore use all of the pictures and names in the ritual. Ed is a fine author on a number of Magickal subjects and one of the founders of the Gardenerian tradition in America. Back in 2006 we were at Mt. Shasta to film sequences of a mystical movie called “Beyond Lemuria.” Though not a Dragon movie, I thought the place too special to miss the chance to do some ritual in this most sacred spot. It seemed all the more sacred when we found a medicine circle left by the native American Indians to commemorate the death of either a Chief or noted medicine man (we couldn’t get the story straight), but clearly it was something Magickal. As my wife is very connected with the Dragons (she has a cat and a young Dragon that guides her to the Elder Dragons on occasion), I had Dragon’s running through my head. So the idea of a Dragon ritual was born. In between scenes while on the mountain the ritual was written over a couple of days. I then asked if Ed would mind assisting me and he agreed. As I needed some Dragon treasure and something for the Quarter elements, we obtained several rolls of dimes (sparkly in the Sun), some alcohol for the fires in the South, a bottle of water for the West and some bread/crackers (i.e. food) for the living in the Earth plane in the North, thus corresponding to our Hermetic style of rituals. Performing the ritual was interesting. I had never performed a ritual in the daytime before. The Sun energy in the East was very high and somewhat distracting. In the South we burned the alcohol but did not realize that in the sunlight it was neatly invisible and we were both mildly burnt by it during the ritual. While casting the water in the West, the feeling to the dry land there, soaking up the offering was very strong. Then the offering of food in the North (food was cast to that quarter), gave a feeling of gratitude by the small unseen hungry animals in the area. There was, I believe a brief vision of a Dragon near the Sun but it I am not clear on that as it was brief. After the ritual we realized that we were both Sun burned.. So, it appears, something happened. In any event we hope you enjoy the ritual. 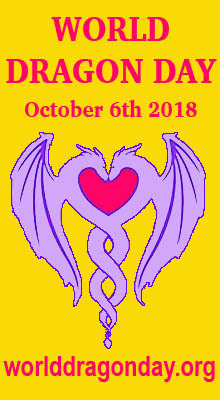 My wife and I have a small group called “the Mystic Order of the Purple Dragon” which you will see in the ritual write up. See Amazon for the movie by that name as well as the website http://www.BeyondLemuria.com. Click on the picture of the mountain to enter further into the site). Also there are clips on You Tube that you might like. Each of us plays two characters. I play the materialistic Dr. X and the spiritual Dr. Xavier, while Ed plays the materialistic Colonel Rich and spiritually seeking (but initially on the wrong path) Reverend Bobby-John Rich. I have looked over your site but cannot figure out how to send or attach a word document. How do I do this? I’ll be quite busy for the next few days so I might not be able to get to posting your ritual and photos straight away, but you can email them to me at draconictopaz@gmail.com thanks …looking forward to seeing it all!